Because their bones, muscles and bodies are still growing, teen athletes need specialized care after a sports-related injury or illness. Where you take them matters. The Sports Medicine Program at Children's Healthcare of Atlanta is one of the only programs in the country dedicated exclusively to caring for adolescent and teen athletes. Our trusted team of sports medicine primary care physicians, orthopedic surgeons, certified athletic trainers and physical therapists is trained in age-appropriate techniques and focused on treating sports-related injuries and conditions in elite young athletes. Little league elbow: Little league elbow is an overuse condition that causes pain in the inner elbow. The pain may be severe and occur after one hard throw or occur gradually over a season. There may also be swelling, redness and warmth over the inner elbow. With repetitive throwing, and not enough rest in between, the growth cartilage in young athletes weakens and begins to develop tiny cracks. The cartilage may start to pull apart from the arm bone. This is an overuse injury. The best way to prevent and recover from any type of overuse is to rest and minimize the activity that is causing pain. It’s also important to use the right equipment and supportive footwear. Osgood-Schlatter disease (pain below the kneecap)*: This is an overuse condition that causes swelling just below the knee on the upper part of the tibia, or shin bone. It's common in young athletes who participate in football, soccer, basketball, volleyball or gymnastics. The repetitive rigorous motion of walking or running during sports overworks the growth center of the knee, causing inflammation, pain and a bump or knot that arises at the top of the shin bone. It's most common in preteens at the peak of their growth potential and affects more boys than girls. Patellofemoral stress syndrome (knee pain)*: Commonly known as runner’s knee, patellofemoral stress syndrome (PFSS) causes pain in the front of the knee. The pain increases with activities like running, jumping and going up and down stairs. It's common in runners and kids who play sports like soccer, lacrosse and volleyball. There are many causes including flat or pronated feet, knees that turn in while running, muscle imbalance, insufficient training and wearing shoes without enough support. Proper stretching and strengthening the muscles around the knee is an important key to prevention. Sever’s disease (heel pain)*: This is an overuse condition that causes pain, swelling and tenderness in the heel. It's commonly seen in young athletes who do a lot of running and jumping. It is commonly found in gymnasts and soccer, football, basketball and baseball players. Sever's disease is caused by repetitive pulling on the Achilles tendon that overworks the growth center of the heel. The condition can persist for two to three years, but it won't lead to problems later in life if treated properly. *Denotes an overuse injury. The best way to prevent and recover from any type of overuse is to rest and minimize the activity that is causing pain. It’s also important to use the right equipment and supportive footwear. Athletic training: We understand the demands and pressures that young athletes face as they play sports, and we believe they need to be managed differently than adults. Our team of certified athletic trainers advises young athletes on how to prevent injury and provides care if they get injured. We work with athletes to help them return safely to the field. Physical therapy: Our physical therapists are experts trained in treating the causes of sports-related and orthopedic injuries in young athletes. We address these issues so the athlete is able to return to their sport as quickly and as safely as possible. Sports primary care: Our sports medicine physicians provide comprehensive evaluation for a wide range of conditions that affect all kinds of athletes, from baseball players to dancers. We will determine the cause of injury and provide instruction on next steps in the care of young athletes. Sports surgery: Our orthopedic surgeons have the expertise to surgically repair injuries in growing athletes. 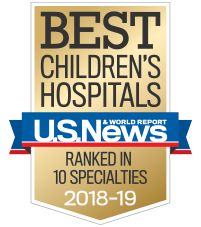 U.S. News & World Report ranks us among the top pediatric orthopedic programs in the country. Our surgeons, doctors, physical therapists and certified athletic trainers are dedicated to helping young athletes recover from sports injuries. Because we only work with kids, we recognize when they are ready to progress to the next level of treatment and how to push them. We use special equipment and technology to find and correct techniques and mechanics and improve sport performance. We have the technology, training and team to best treat your child. Our program is led by orthopedic specialists. Our doctors and surgeons work closely with orthopedic surgeons in the community to help ensure complete, coordinated care is delivered seamlessly at our hospitals for children with sports medicine needs. Our Sports Medicine Program is led by our Medical Director, David Marshall, MD. and our Surgical Director, Michael T. Busch, MD. Our Orthopedic Quality and Outcomes initiatives are led by our Medical Director, S. Clifton Willimon, MD. We have more than 30 certified athletic trainers on our team. We have more than 40 sports medicine physical therapists on our team. Below are some incredible athletes that you might see throughout Atlanta. These strong kids are not actors—they're real patients, with real stories. Scroll through to meet Nick, Aleks, Chaz, Zoe and Alison. Our sports medicine primary care physicians and pediatric orthopaedic surgeons who specializes in sports see patients at our 13 office locations. Our sports physical therapists see patients at our 14 sports medicine gyms.